Too much clutter is not only a sign of stress, it's a cause of stress too. Clutter keeps you from doing things you love, it costs you money (yes, really!) and makes you feel out of control. 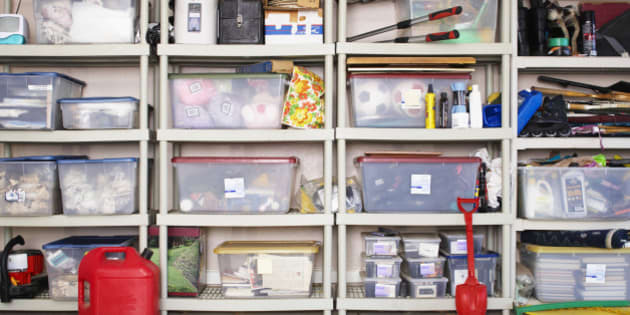 Peggy Caruso, life coach and author of "Revolutionize Your Life," says getting organized and reducing the clutter can lead to an overall sense of calmness. But getting organized can be a challenge when faced with massive piles of stuff everywhere. Excessive clutter and disorganization are often considered a symptom of other health problems. The New York Times reports that individuals who suffer emotional trauma, chronic pain and depression are likely to find cleaning to be an insurmountable task. Caruso says starting small is the key to de-cluttering both your home and your whole life. From making mental notes to editing your social accounts to donating your wardrobe, Caruso shares simple de-cluttering tips to help you restore balance in your life. A cluttered home is both a sign and source of stress. Peggy Caruso, life coach and author of "Revolutionize Your Life," says creating calmness in your mind can also lead to amazing results in the home. Silence the noise that makes you overwhelmed by meditating each morning. Focusing your energy early will prevent you from procrastinating later in the day. If meditating isn't working for you, Caruso also recommends keeping a daily journal. Narrowing in on what makes you most productive will help you eliminate distractions and give you more time to de-clutter your home. Digital noise can create negativity in your life. Caruso suggests removing negative feeds and people from your social media accounts to create a positive flow of energy in you life. Keep yourself motivated by making a list. When faced with too many tasks, it's easy to spend hours deciding where to start. A list of priorities, however, means you can spend less time thinking about de-cluttering and more time actually doing it. Don't forget to break it down into smaller 'doable' tasks, instead of huge ones. You'd never miss a work appointment, so why do you pass on making personal ones? Caruso says planning ahead will help you manage stress and clutter. All you need is 10 minutes a day to keep mess at bay. Making time to for yourself doesn't only mean making time to clean. Reducing work and social commitments will also give you more time for the things you love. Organizing sentimental items can be difficult. Caruso suggests determining an item's value before you decide how you're going to deal with it. If there was a fire, would you want to save this item? What purpose does this item serve? Does this item make you smile? Your answers will give you a better sense of how important the item really is. Even if an item makes you smile, Caruso says you should try to implement the one-year rule for your personal items. If you haven't touched it in a year, chances are you don't need it. But what about those comfy jeans you're keeping for "fat days"? Well, Caruso says you should get rid of those too. Keeping baggy clothes is like telling your mind you need to gain weight, she says. De-cluttering is a great way to teach your kids how to save, sell and share. Caruso says we already teach kids how to save, spend and share, so why not teach them that they can also sell items they no longer need?